While the ease of upgrading your Windows operating system may have increased over the years there is no getting over the common upgrading problems even with Windows 7. With older operating systems like Windows 3.11 it took up to six hours and up to a dozen floppy disks to install a new operating system on a Windows machine. The popularization of the CD made upgrading to Windows 98 and Windows XP easier but was still a time consuming process that required the user to complete prompts during different instances of the installation. Windows 7 upgrades are now available for download or can be installed using a DVD. Additionally, Microsoft has streamlined the installation process by allowing the installation to take place without much user interaction but there still exists a common set of Windows 7 upgrade and installation problems. Installation Stops at 62 Percent – When upgrading from Windows XP or Windows Vista to Windows 7 you may experience a complete stop in the installation of Windows 7 at the 62% mark. While it’s normal for the installation to stop progressing for a few minutes, if your upgrade of Windows 7 stops for more than ten minutes this would be a cue that an upgrade error has occurred, even if you have a slow computer with not enough RAM. The error occurs due to a system service called Iphlpsvc which has stopped responding during the Windows 7 upgrade. All you have to do to correct this error is download the Microsoft solution named MicrosoftFixit50319. Windows 7 Upgrade Doesn’t Stop Rebooting – Also known as the Windows 7 upgrade reboot loop, this error is caused by a software bug that presents a message that Windows 7 could not be installed over and over and states that the operating system has been restored to Windows Vista. Of course no such restoration takes place and the same error message continues to appear. To avoid this reboot loop, choose Vista from the boot menu at your computer startup. 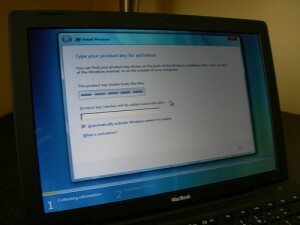 Then insert the Vista install CD/DVD. Exit the Vista setup when it appears and click Start–> All Programs–> Accessories. Right-click Command Prompt and select “Run as Administrator” from the user menu. At the command prompt/window, type “D:\boot\Bootsect.exe /NT60 All”, Replace the letter “D” with whatever drive contains the installation and this will reset the boot for Windows 7 upgrade stopping the reboot loop cycle. Bad Product Key for Windows 7 Upgrade – You finally complete the installation or upgrade of Windows 7 and a prompt appears which states that you must input the product key to activate the operating system. After spending several minutes typing the digits Windows 7 tells you that product key is invalid! You think there must be a small input error and retype the code more carefully but the same error message for an invalid product key appears. What should you do? Simply call Microsoft Support at (800) 935-5700 and explain the situation to them. The Microsoft representative will ask a series of questions about your software to validate that you infact have a genuine copy of Windows 7 and with then relay a new product activation key for your Windows 7 upgrade.